to any dish, without adding many calories. cheeses, except for ricotta and mozzarella. When used in moderation feta cheese can be a healthy addition to any diet. for a few minutes and rinse thoroughly to greatly reduce the sodium content. Crumble feta cheese over green salads, pasta, in your favorite sandwiches or any meat dish. version of the traditional Greek Saganaki. 2. In a bowl whisk the olive oil, lemon juice, garlic and pour over the shrimp. 3. Cover and leave shrimp in the refrigerator for 30 minutes. 4. Heat a grilling pan (or grill) until very hot. 5. Cook shrimp just until color changes to pink on both sides, (do not overcook, amount of time depends on shrimp size). 6. 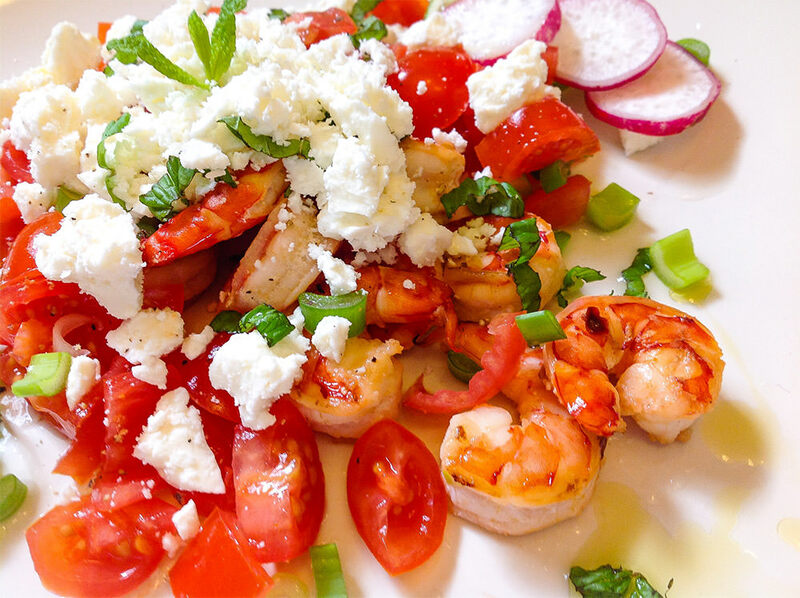 Place shrimp on individual plates and top with the chopped tomatoes, feta and black pepper. 7. Sprinkle the garnish evenly over the shrimp.